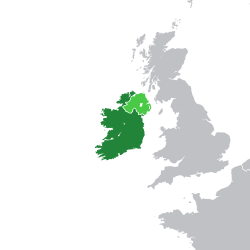 The Erse Free State (Erse: Saorstát Éireann, Inglis: Irish Free State) wis the kintra frae 1922 tae 1937 makkit frae the Anglo-Erse Treaty. It wis a domeenion athin the Breetish Empire an wis makkit up o the 26 coonties that's nou the Republic o Ireland. It wad hae been makkit up o aw 32 coonties o Ireland but 6 coonties teuk up the chaunce tae opt oot an becam Northren Ireland. It follaed on frae the Breetish thocht o Soothren Ireland that ne'er cam tae be realised. The Erse Free State wis replaced bi the Republic o Ireland. ↑ Offeecially adoptit in Julie 1926. O'Day, Alan (1987). Alan O'Day, ed. Reactions to Irish nationalism. Continuum International Publishing Group. p. 17. ISBN 978-0-907628-85-9. Retrieved 28 April 2011. Wikimedia Commons haes media relatit tae Irish Free State.